Globally over 1 billion people still have to collect water from natural sources such as rivers and springs, putting them at great risk from disease and placing a huge burden on women and girls who have to collect the water on foot. Providing them with a well to give clean water is therefore a tremendous boost to their quality of life. 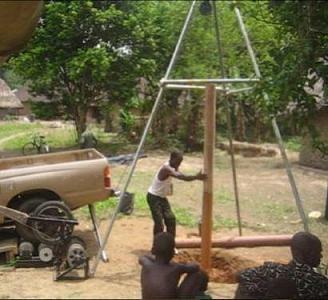 Developing Technologies became involved in this vital area of need when a small NGO in Sierra Leone sought help in drilling wells for local villages. The percussion drill, in which a heavy drill bit is repeatedly raised and dropped, was chosen as the drilling technology. It is simple and effective in all soil conditions. Our initial design incorporates transport with powering the drill, using a pick-up to drive the winch through friction rollers and a clutch. This is being successfully tested in Sierra Leone. We are also collaborating with a UK charity, Africa Research Institute (ARI), to develop a version driven by a small diesel engine and this is being successfully tested by ARI in Tanzania. 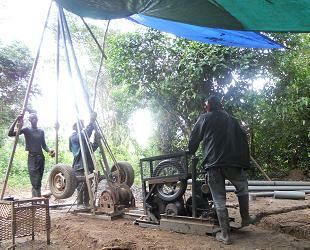 Our low- cost equipment allows significant cost saving in drilling wells.